I’m a great believer in the rule, but I want to make an exception in this case because it’s a story about Bryce Courtenay, Australia’s most popular writer, who died last week, aged 79. And I don’t think he’d mind me telling it. Bryce and I and cameraman Les Seymour went on the road for the Channel Nine Sunday program in February 1994 two months before the first democratic elections in South Africa. The idea was to take Bryce back to his homeland, and test the racial temperature before the most crucial elections in the nation’s history. Among the places we visited: the town where he was born in the Limpopo province, a former bastion of apartheid; an afternoon with the far right AWB (Afrikaner Resistance Movement) at their training camp in Komatipoort on the Mozambique border; a primary school in Barberton where black families successfully sued the local school board to get their children in; Barberton prison with the nation’s first black warden; Bryce’s primary school in Duwielshloof, complete with his name in an old roll book; the exclusive King Edward VII school in Johannesburg, where he reportedly won a scholarship; a school for African National Congress (ANC) children outside Durban in the heart of Chief Buthelezi’s Inkatha Freedom Party territory, and a children’s home, where his sister Rosemary helped out, and their choir sang for Bryce. That was followed by a poignant moment when Bryce went to his sister’s house to see his mother, who was then 88. He couldn’t have been happier. We also went to the school where the Soweto riots began in June 1976: Morris Isaacson High, about a kilometre from Orlando West, the setting for one of the most famous photos of its time: A 13-year-old schoolboy, Hector Pieterson, being carried down the streets of Soweto by a fellow student after being shot from behind by South African security police. Hector was among the first of at least 500 to die (the estimates vary) in what started out as a peaceful protest, and he became the symbol of the resistance movement. For me, it seemed like 1976 all over again, and Bryce did a nice piece to camera – one of his daily diaries that we used to keep the story moving along. I was happy that Les Seymour was taking cutaway shots in a nearby classroom. His camera could have looked like a rifle on a tripod, and the nervous white policeman might have over-reacted. Next stop was Phalo Park, a squatter camp in the East Rand, as the sun was setting and a thunderstorm was brewing. Les managed to find a great local choir, singing songs about Nelson Mandela, as Bryce wandered around the camp. We drove Bryce to the airport, as he had to go back to Sydney to give a motivational speech to a business group. It added another air fare to an already expensive shoot, but Bryce was keen to come back. And, it was, after all, his story. But I had to laugh when the story was nearly in the can and Bryce did a publicity interview on Nine’s Today Show on the Friday morning before the Sunday Program went to air. He described how the sun was setting, and he heard these beautiful voices and there was this rag-tag choir singing songs of praise to Nelson Mandela. After the interview, I called Bryce and congratulated him, adding jokingly: “But I have to ask: were you on the same trip?” And he laughed, and said: “It was for publicity, Tom.” Or as Bryce once told ABC-TV, his job was “to dress the naked truth, to make it interesting, to make it viable, to make it seem like something you understand and feel and love.” When Bryce told the story of finding that choir, he made me believe he was there, even though he wasn’t. And he was doing it to promote the program. He was a great storyteller. Bryce Courtenay was also a great actor. On day 10 of the shoot, we went to King Edward School (known locally as KES) in Johannesburg, and Bryce addressed a class of sixth formers about his life and his most famous novel, Power of One, partly set in KES. He told them how emotional he felt, returning to his old school and finding it was integrated. He even got a bit teary, and we put a radio microphone on him, and sure enough he got teary again. You could say it was manufactured the second time around (shades of Broadcast News), but there was no doubt: they were real tears. The students didn’t seem to mind; they loved him. And there was a voter education class for the upcoming elections going on in the same hall where Bryce had started a weekend school for Africans, which the principal and the South African Police had closed. Talk about irony. Our last day was potentially the most dangerous, heading for the Cape Town flats where Bryce was going to talk to some of the notorious mixed race gangs in Manenberg, the scene of two shootings the night before. Our guide was Boola, a law student at the University of Western Cape, and a former activist, who spent time in detention without trial. He was also a Wallaby fan. There were 42 gangs in Manenberg, including the Hard Livers, the Clever Kids and the Jesters. One of the gang members saw Boola in our van, and greeted him by pulling a big knife from his coat and sliding it past his throat. “Welcome to Manenberg,” said Bryce. We got to talk to the leader of the Hard Livers, Rashid, who didn’t give much away, except that the gang lived up to its nickname. They were definitely Hard Livers. Boola asked one of the teen-aged gang members if he’d been arrested, and he said: “Yes, for murder.” A quiet day at Manenberg. Throughout our two-week journey around South Africa, we had little time for lunch, so whenever we were on the road, we had hamburgers. 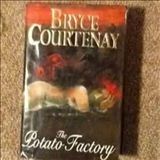 In the van, Bryce was researching his next book, The Potato Factory, reading up on 19th Century London, whence two of his characters make their way down to the convict settlement of Van Diemen’s Land, and a life in Hobart. His literary critics dismissed him for being too popular, but they should have seen how much work he put into each of his books … and I might add our cover story. The Children of Apartheid rated well on the Sunday Program on April 10, 1994, and later that month as a documentary special on Anzac Day. He liked it and so did Les and I, the editor, Mike Connerty, and the executive producer Stephen Rice. But, no, it didn’t win a Walkley. As these things often happen in television, Les and I lost contact with Bryce, though I did occasionally run into him at book launches. And he always brought up the subject of the ubiquitous hamburgers. Please forgive me, Bryce. If there are hamburgers in Heaven, let’s have one for the road and one for your next story. I look forward to both. Thanks for your comment. I did not post a video, just wrote about a story I produced with Bryce as a tribute to him. I have written 120 posts, including one which will be published later today, in the past two years, a total of about 200 thousand words. I hope there was something informative in one of them! Regards.